question_answer1) Why was the North Atlantic Treaty Organization also called Western Alliance? question_answer2) What is meant by Hegemony? question_answer3) Which major factor was responsible for the dramatic victory of Indira Gandhi in 1971 elections? question_answer4) Name the three social and political regions of the Northern most State of India. question_answer5) Why were the seven small states created in North-East India? question_answer6) What is meant by the Cuba Missile Crisis? question_answer7) Suggest any two steps to be taken by the government to check pollution and save environment. question_answer8) 'Welfare State is getting replaced by market.' Analyse the reason for this change. question_answer9) How did the Sino-Indian conflict affect the opposition also? question_answer10) How did the dominance of Congress Party in the first three general elections help in establishing a democratic set-up in India? question_answer11) Why did Indian distance itself form the two camps led by the U.S. and the Soviet Union? Explain. question_answer12) Describe any four major developments in the Indian politics since 1989.
question_answer13) How was the European Union evolved over time from an economic union to an increasingly political one? question_answer14) Explain any two merits and two demerits each of the Green Revolution. question_answer15) Critically evaluate the difficulties involved in implementing the suggested reforms to reconstruct the U.N.
question_answer16) Assess any two positive aspects of the Chipko Movement. The interim government took a firm stance against the possible division of India into smaller principalities of different sizes. The Muslim League opposed the Indian National Congress and took the view that the States should be free to adopt any course they liked. Sardar Patel, India?s Deputy Prime Minister and the Home Minister during the crucial period, immediately after Independence, played a historic role in negotiating with the rulers of Princely States in bringing most of them into the Indian Union. (i) Which government has been referred to as the interim government? (ii) Why did Muslim League oppose the Indian National Congress? (iii) What makes the role of Sardar Patel a historic one? Explain. The New Congress had something that its big opponents lacked - it had an issue, an agenda and a positive slogan. The Grand Alliance did not have a coherent political programme. Indira Gandhi said that the opposition alliance had only one common programme (Indira HataoMn contrast to this, she put forward a positive programme captured in the famous slogan 'Garibi Hatao'. (i) Which Congress is being referred to as 'the New Congress'? (ii) Highlight any two steps taken by Indira Gandhi to remove poverty. (iii) How far is it justified to call the 'opposition alliance' as the 'Grand Alliance'? The Cold War was not simply a matter of power rivalries, military alliances and of balance of power. These were accompanied by a real ideological conflict as well, a difference over the best and most appropriate way of organizing political, economic, and social life all over the world. (i) Why is a war - like situation called Cold War? (ii) Identify one military pact each signed by each of the two super powers to balance the power rivalries. (iii) Differentiate between the ideologies represented by the rival blocs. (i) Which country is represented by this mighty soldier? (ii) Why have the names of so many countries been written on the uniform of the soldier? 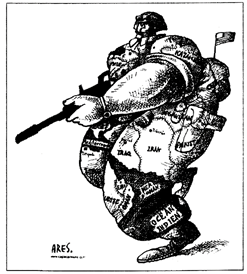 (iii) What message does this cartoon convey to the international community? 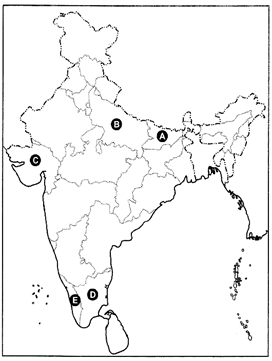 In the outline political map of India given above, five States have been marked as A, B, C, D and E. With the help of the information given below, identify them and write their correct names in your answer book along with the serial number of the information used and the related alphabet in the map. (i) The State to which C. Rajagopalachari, the first Indian Governor-General of India, belonged. (ii) The State where the first non-Congress Government was formed by E.M.S. Namboodiripad. (iii) The State to which Rail Ahmed Kidwai, the ?Union. Minister for Food and Agriculture (1952- 54) belonged. (iv) The State which faced the most acute food crisis in 1965-67. (v) The State which led the country to White Revolution through. Dairy Cooperative Movement. Describe any six criteria for the new membership of Security Council as suggested after 1997. What is meant by Security? Mention any four components of Indian security strategy. Describe any six factors responsible for the disintegration of U.S.S.R.
What is meant by New International Economic Order? Mention any four reforms of the global trading system proposed by UNCTAD in 1972? Explain globalization. How has technology contributed in promoting globalization? Explain the meaning of 'global commons'. How are environmental concerns becoming important in global politics? Examine any three factors responsible for the US hegemony in the world politics. Assess the positive and negative aspects of Indians relations with Bangladesh. Suppose you are an important leader of the Farmers? agitation. The government authorities ask you to present any three demands on behalf of the farmers. On priority basis, which three demands will you make? Support your demands with appropriate arguments. In 2014 elections, people have voted for stable government at the Centre. Do you think that the era of coalition has eneded? Support your answer with suitable arguments. Analyse any three lessons learnt from the emergency of 1975. Analyse any three major factors which led the popularity of Indira Gandhi's Government in the early 1970s.